We here at IDrive take great pride in knowing our customers are satisfied with our service. That’s why we love hearing from you, not only to boost our egos, but to continue to learn new ways to improve our product and keep you comfortable with your backup needs moving forward. Here’s a few recent testimonials that almost had us blushing! It’s what we do! Disk crashed, hard drive failed, natural disaster destroyed your device? Just do a restore and pick up where you left off. No need to thank us, George! It’s always nice to hear when our service helps avert a data crisis. Backup your data with IDrive today and rest easy knowing your files are safe no matter what happens. Thanks to loyal customers such as Anandh, not only is IDrive the back to back winner of PC Mag’s Editors’ Choice for top consumer backup solution, we’re also PC Mag’s top choice for Business Backup. None of this would be possible without the continued support of our customers and we plan to keep building on that success. The simplicity of our software is one reason we are beloved by so many IT professionals and consumers, and our affordability is second to none. Have a house full of devices that need to be backed up? With IDrive, backup all your devices into a single account at no extra charge. And don’t worry Mr. Sweatpants, feel free to rave about us any time! Want to see what all the fuss is about? Sign up today! With just one account, IDrive allows you to backup all of your devices and store your data in one easily accessible location. If you have a large amount of data to back up and want to have it done quickly and securely without tying up all your bandwidth, IDrive Express is the ideal solution. The File Sync feature of IDrive makes sure that all your files are synced and kept uniform across all your devices. IDrive doesn’t just backup all of your personal devices, it can also backup all of your Facebook and Instagram photos. IDrive gives you the capability to manage all of your backups remotely through its web console. With CDP, IDrive automatically senses when files are changed and resaves the backups in real time. The IDrive automatic Archive Cleanup process ensures that even once you’ve deleted items from your devices, they are not deleted from your cloud storage. IDrive offers a hybrid storage solution by giving you the options of both cloud and local backups. IDrive can back up all of your server data, in addition to making all of your files secure and available across your network of devices. IDrive also keeps you informed with built-in reporting tools and a management console. Thank you to PC Magazine! Are you Staying Smart? Here’s the Latest on IDrive Smart Docs! It’s been a few months since we released our Smart Docs app and we’re happy to announce its been a hit with IDrive users! We see more and more users everyday leveraging Smart Docs to help them stay up to date on license renewals, passports updates and staying on top on their critical documents. We are always looking to improve our products, so we have some minor bug fixes that are being updated, and discussing more enhancements. Thank you too all our IDrive users who “Staying Smart,” and using Smart Docs to improve their digital organization. Imagine a storage drive that not only protects your data, but lets you access it wirelessly over wi-fi, and even stream videos and music. Our latest cloud backup storage drive, IDrive One, does just that, combining a handful of amazing functionalities in one insanely versatile device. 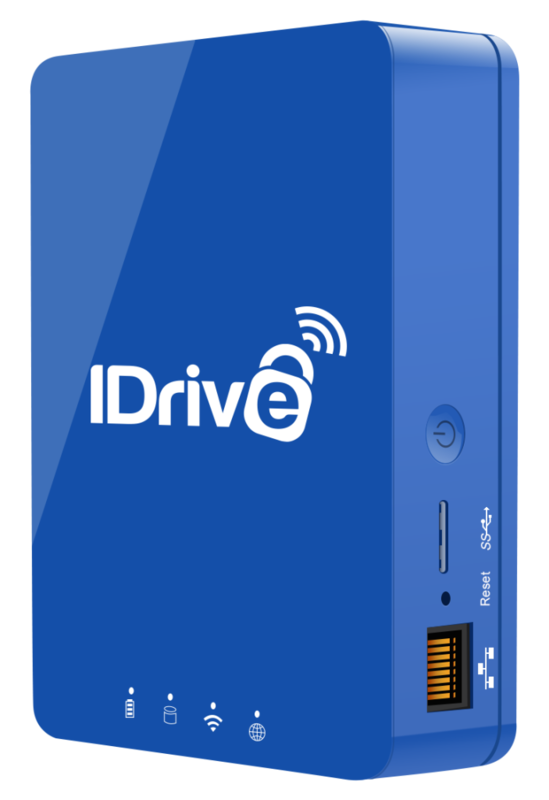 With added SSD internal drives, IDrive One offers FAST backup and streaming capabilities. Chances are you’ve experienced slow backup or restore speeds that get in the way of your work flow or personal life. To eliminate that slow crawl from your backup experience, we fitted IDrive One with 802.11 AC. AC is the speediest and strongest wireless standard today. Its connectivity travels through more walls with faster speeds and works with both old and new technologies. With a range of up to 150 feet, you’ll never feel tethered to IDrive One as you might with a wired device. Rather than make you wait to transfer your data, AC standard will make for swifter backups and streaming. Between all your pictures, videos, and apps, storage can run out fast. With IDrive One, running out of mobile storage is a frustration of a past. That’s thanks to the IDrive One App, enables you to seamlessly transfer your mobile data to the drive, creating space on your devices so you never experience those pesky “out of storage” notifications again. All data backed up to the IDrive One device is guarded with military grade 256-AES encryption with an optional private key known only to the user, so that no one else can access your data but you. IDrive One is available in two models: 128GB ($99.99) and 256GB ($149.99). Each drive comes with a free year of IDrive’s online backup solution, which keeps your data secure and accessible from anywhere via the cloud. Each drive comes with a year free of IDrive Cloud backup with 1TB of space. Order the IDrive One drive that’s right for you today! In today’s competitive world, loosing critical data can be a distressful experience for your business. With work happening 24/7 at your enterprise, data travels between a variety of devices. Hence, loosing data on even one device can prove out to be disastrous. That’s where IDrive’s backup solution can help, as it can safeguard your small and medium scale businesses. Your business can not only protect critical data from threats, but also easily access data from anywhere, anytime. IDrive does enterprise – level backup from beginning to endpoint. We provide tools to protect your organization, from servers to smart phones. The simplicity of the product and its resourceful features, makes it an obvious choice amongst customers. Admins can view, manage, monitor users IDrive account activities from the dashboard. Backup unlimited PCs, Macs, iPhones, iPads and Android devices to a single account. IDrive provides 256-bit AES encryption with an optional private key, so that all data during transfer and storage are encrypted. Backup your Windows and Linux servers. Also includes SQL, Exchange, SharePoint, VMware, Hyper-V, and Oracle backups – at no additional cost. You can quickly transfer large amount of data up to 3 TB to your online account for FREE, within a week via physical shipment of hard drives, without using bandwidth. Get an IDrive account today and stay protected! You can visit https://www.idrive.com/enterprise/ for a 30 – day free trial. Introducing RemotePC Team Plan for Business! RemotePC by IDrive helps businesses to stay connected with distant computers, by helping to establish a remote session with connected computers to access and share files, print documents using a local printer, collaborate with associates or provide them support. With the new Team Plan for Businesses, organizations can add users within their account and organize them into teams. As one can invite any number of users to join their RemotePC Team account, it becomes convenient for businesses to grant all their employees the flexibility to work from anywhere, be it from their homes or from a client’s office. Access 100 remote computers from a single account and based on needs even access extra computers for additional charges. An Admin can manage remote access rights for users and their associated computers via a centralized web console. Suspend a computer to prevent others from accessing it remotely. Remove computers or users that are not in use or are no longer a part of your organization. Admin can also monitor remote access activities for users and computers connected to their account with detailed session and activity logs. RemotePC by IDrive is not only the most affordable solution, but it also comes packed with features that will make your remote access experience a simple and seamless one. Flexibility to work from anywhere! RemotePC is a platform independent remote access solution which allows you to stay connected with your home or office computer, without actually commuting. Access your farway computers in a matter of few clicks. Your remote PCs and Macs are accessible remotely not only via the RemotePC desktop application, but you can even access them while you are on the go with our mobile apps for Android and iOS – over 3G, 4G and Wi-Fi networks. Accessing your remote computer while you are in some faraway location is also possible as you can use RemotePC via web browser. It serves as an ideal solution for computers where software installation is restricted. RemotePC uses TLS v 1.2/AES-256 encryption security for transferring the user authentication data between your remote or local computer. Apart from that, you can even set a unique key to connect to your computer. Ensure privacy of your remote sessions by blanking the host computer screen. Thus anyone near the physical monitor you are accessing will see only a blank screen while the session is active. Need a remote access solution for your business? Sign up for RemotePC today and avail 50% off on the RemotePC Team Plan.